I’ll bet you’re confused as ever when it comes to the simplest ways to build muscle. 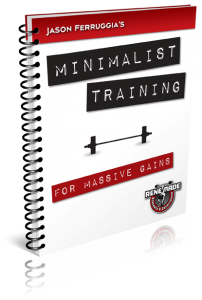 Many coaches and trainers have tried to convince you that you need to add a lot of fluff to your training program: tempo prescriptions, random progressions, and fluctuating training frequencies, just to name a few. Well, I’m here to cut the B.S. and tell you what really works. So I’m passing on three ways to instantly boost your size and strength – the simplest way possible. How to do it: pick two compound exercises – one for the upper body and one for the lower body. Perform those same two lifts three times per week. Example: pair up the deadlift and standing military press. Out of all the exercise combos that you can pick from, the deadlift and standing military press are two that hit virtually every muscle group in your body. How many sets and reps? You can’t go wrong with 5 sets of 5 reps of each exercise with the heaviest load possible. Do this workout on Monday, Wednesday, and Friday. Progression: focus on adding weight, even if it’s just 5 pounds each week. How to do it: pick three compound exercises – an upper body push, an upper body pull, and a squat or deadlift. Perform those same three lifts three times per week. Example: combine the squat, military press, and chin-up. These three exercises will hit every muscle group in your body. To this day it’s one of my favorite circuits. Again, you can’t go wrong with 5 sets of 5 reps per exercise. Perform this workout on Monday, Wednesday, and Friday. How to do it: pick three compound exercises like you did for Method #2. Let’s choose the deadlift, military press, and chin-up. Another option is to perform the squat, incline bench press, and one-arm row. Perform those three exercises three times per week but decrease the number of reps for each set every two weeks. Example: start with 4 sets of 8 reps (4×8) for the first two weeks. Then do 5×7 for another two weeks. Next is 6×5 for two weeks. Finally, finish up the cycle with two weeks of 9×3. These three methods are used by hypertrophy expert, Jason Ferruggia, one of the best guys out there who can simplify your mass-training cycles for non-stop gains. To find out just how easy it is to quickly gain muscle and strength just Click HERE. In the squat, military press, and chin-up, where does your chest get worked? Well, 3 times/week of 5×5 with the same exercises and the highest load possible? Here’s how it will go down for someone who’s been lifting for at least a few years: he will lift the same weight for several weeks, and then simply regress and burn out. I love simplistic stuff, but I was hoping there’d be some more well-thought ideas here. Also, keep in mind that “the highest load possible” is actually a very simple, accurate way to keep fatigue in check. In other words, the highest load you can lift on Wednesday might be 10% less than it was on Monday due to fatigue. Now, if I said to use the same load throughout the week for 5×5, I can see how you could think that might lead to overtraining. Again, the “highest load possible” will lead to different loads throughout the week. Some days you’ll be stronger than others, but in the end, a short cycle of this type of training can lead to a nice rebound of strength/mass once you switch to a different program. I want to try the deadlift, military press and chin combination but like another poster said I feel five sets of five will blow me away. Is there any rough guidelines to what percentage of max weight will suffice for the three workouts? CW: Don’t get too hung up on the loading at first. Just do 5×5 with a load that’s challenging. Basically, start with a weight you could lift 8 times and do 5×5. Rest as much as needed at first, then reduce the rest periods as your work capacity increases. Sorry Chad to ask a further question on this but would you advocate different rep schemes on your lighter days say sets of eight on your medium and sets of ten on your light? Or what about Wendlers 531? I quite like the 5,3,1 approach. Would it be possible to do a progression based around doing a Wendler type 531 on heavy days ( for me Mondays ) if for the other two days exercise ( Wed & Fri ) I just done 5×5 or 3×5 with a sixty percent load so as to keep the CNS from being over trained? CW: There are a lot of ways to approach this and it primarily depends on your goal. What you mentioned would be good for building strength, but it wouldn’t be ideal for adding muscle since you’ll need more volume. Check out my book, Huge in a Hurry. In there I outline many ways to make different rep schemes work throughout the week. For beginner/intermediate lifters, one effective way to gain muscle is to lift heavy Monday (8×3), medium-heavy Wednesday (4×6) and lighter on Friday (2×20) for each exercise. I have ordered the book (Huge In A Hurry ) along with an earlier one of yours as I am pretty sure they will be of great interest due to your no nonsense approach at making the science of muscle and strength gain easy for the layman. A question though by Andy at the top of this page is one I myself was wondering. The Dead lift, Military Press and Chin Up combo seems to work everything apart from the chest however I really feel my chest is sore after these movements. How come? Is a Chin Up a good movement for chest? I wouldn’t have though so but my chest never seems to get worked using Bench Presses. Are these three movements enough to work the chest? CW: Those movements aren’t enough for chest development. You need some type of horizontal pushing such as a challenging push-up variation or a cable chest press. Do i have to do warm up set lets say with 8 reps of 50% RM,befrore the working 5×5 sets or just start with working weight straight away. if not what to do to prepare my body, joints for heavy lifting? CW: 2-3 sets of 2-3 reps with minimal rest between each set for the first exercise is enough to prepare your body for the workout. CW: Yep, that’s a good plan. Sorry Chad to hijack this thread only I dont know where to post general questions to you. I read a recent short article by yourself in which you state that most people dont get the best use out of common or garden push ups. You said that there should be emphasis on drawing your hands together as you push yourself up. Could this method be used on the bench press? I hardly get anything from benching as far as chest development so could I do it the way you highlight in your push ups article by using lateral force in an attempt to push the hands together? What about using a tribar? I think benching with a tribar while trying to force your hands together seems a little better body mechanically. What are your thoughts? CW: Use the cables set at chest height for your standing chest presses instead of bench press. This is covered in Huge in a Hurry.